Brings to Us Best Qualities of Many Foreign Lands. 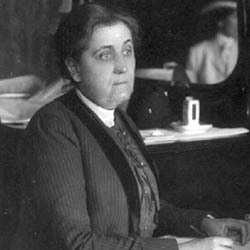 From an Address by Jane Addams, of Hull House. It will be a grave reproach to the American nation in another half century if the spiritual and social value of the immigrant has not been discovered. This country, which has virtually no indigenous art and which has been forced to borrow or import from the older countries, should seize this vital source lying fit to its hand, to enrich its older importations. There is no reason why these modern men and women, taught your modes of expression, should not tell their musical lore, fresh with the tang of the earth, of unspoiled sweetness, to the benefit of American music. They construct their crude little dramas from the common life of their people, yet these uplift, rest, and ennoble the magnificent function of art because the playwrights, like Anteus, have renewed their strength from the earth and have told with forceful earnestness the stories of the immigrant colony. It is when these people give you their own spiritual life, or when you get it, not with investigations, but through a friendly comradeship, as they have preserved it among themselves, that you may benefit. It is not when you have taught them the qualities of your national life. When the colonies that are now hedged about with the barriers of alien customs, alien speech, alien observances, are seen in the light of a larger experience; when they see the new country into which they have been thrust by circumstances or lured by big desires, with a broader sense of the double relation, then the real value of the immigrant will be revealed. A better understanding of the immigrant will be not only a material and artistic and spiritual benefit, but an example in some ways as well. These people whom you regard vaguely as unclean, unlettered, and unworthy of consideration are almost without exception intelligently patriotic, with a pride in their own lands and their own heroes which is only gained after years of study in their countries' histories. These men are versed in international relations; they bring to their relative standing here in the new country a complete knowledge of their relations in the old and a willingness to abide by them. They are, in their completeness, as worthy of consideration as if they were colonized in their own countries, to which hosts of persons go each year for interest or information. But their spiritual value, their picturesqueness, their social value, their industrial significance, are dependent upon their cohesiveness, their exclusion of the superficial influences of the new country which robs them of the best of their inheritance and gives them the worst of their acquisition, and their recognition of their own nepotism as their strongest card in establishing the positions they have come to seek. 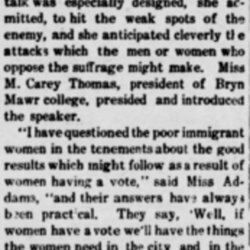 Addams urges the public to have a better understanding of the immigrant so as to benefit from their often unseen wisdom and culture. 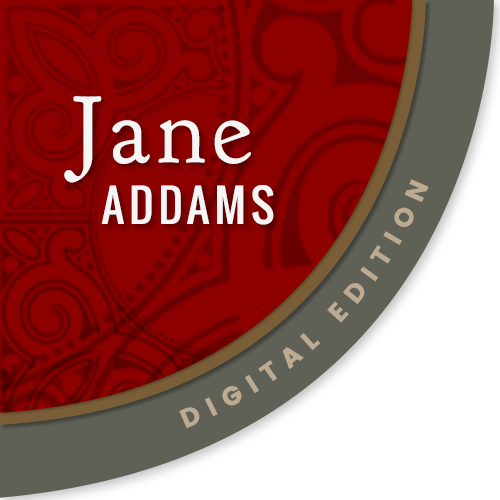 Addams, Jane. "Value of the Immigrant." Washington Herald, Washington, DC. 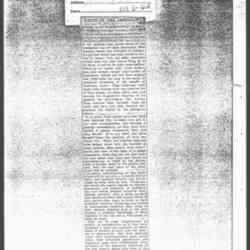 April 5, 1908. p. 7. 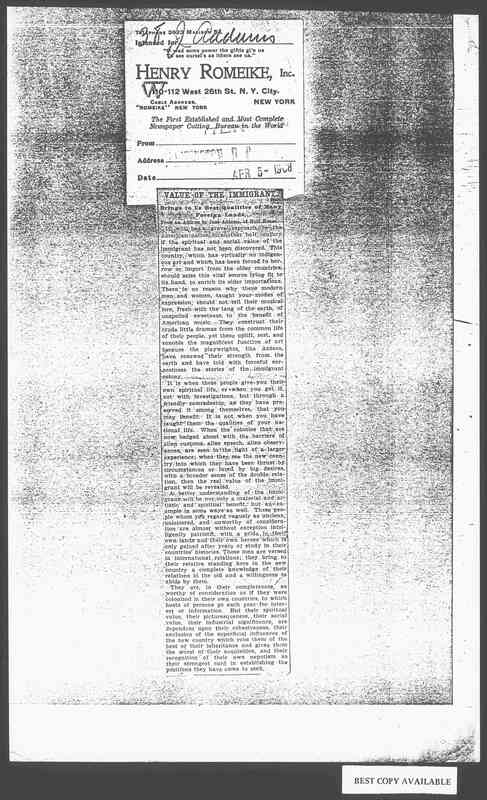 Addams, Jane, “Value of the Immigrant, April 5, 1908 (excerpt),” Jane Addams Digital Edition, accessed April 18, 2019, https://digital.janeaddams.ramapo.edu/items/show/7478.